Wedding in New York was founded in 2009 to meet the needs of couples looking to get married in the greatest city in the world - New York City. We are professional Wedding Officiants who are available for your civil wedding ceremony. 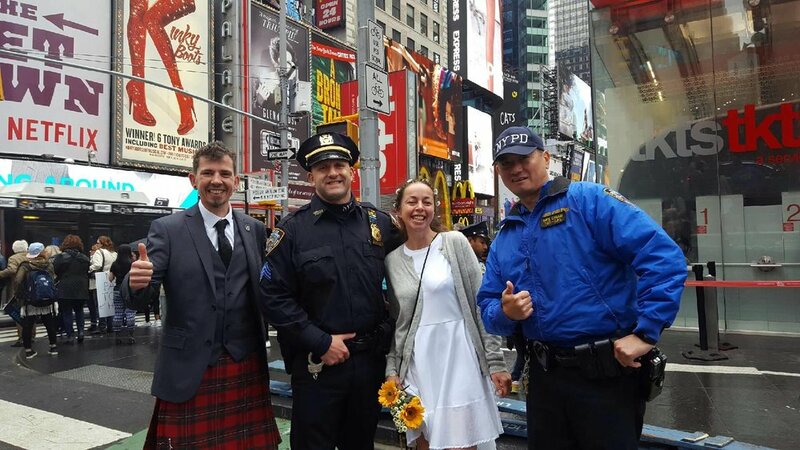 As civil wedding officiants legally registered with the NY City Clerk's office, we are licenced to marry you in any Manhattan or New York City location. Have your ceremony in any New York City park such as Central Park, Riverside Park, Battery Park or Brooklyn Bridge Park. Or you can get married by the ice skating rink in Central Park or even in Times Square. We help make your perfect New York day your perfect wedding day! We pride ourselves on offering inexpensive, yet elegant all-inclusive wedding ceremonies. Our packages include Officiants, photographers and musicians! We understand your choice of a "civil wedding" means you will be joining together in a non-religious union. We respect and support you. We can do just a very simple exchange of vows and rings at the location of your choice, or a more spiritual ceremony depending upon your interest and needs. Our schedules fill up quickly, so please contact us with your needs and we will respond immediately. And if you have a "last minute" civil wedding officiant request, we will always try our best to accommodate you. Our officiants travel anywhere in Manhattan and are available on short notice. Please not that we do not book weddings more than one year in advance. There are steps and paperwork which must be completed to validate your wedding. We often get asked lots of questions surrounding this. We know how easy it is, but we thought the best way to highlight this was for one of our UK brides, Kelly, to share her experience.